Patrick Sullivan is one of seven seniors who will play their last home game tonight for Canisius College. After playing for St. Francis High School, Patrick Sullivan was exploring his options with junior hockey. Uncertain about the ins and outs of the junior hockey process, he went to a tryout in Michigan and made the team. Since the tryouts were in Michigan, he assumed the team was based there. Turns out it wasn’t. The team was in Alaska. Sullivan had never spent significant time away from his Western New York roots but the Derby native packed his bags and spent a season with the Kenai River Brown Bears. The season in Alaska helped him grow as a player and as a person. And when he got the offer to play his collegiate hockey at Canisius, the circuitous route made the hometown experience that much more enjoyable and productive. 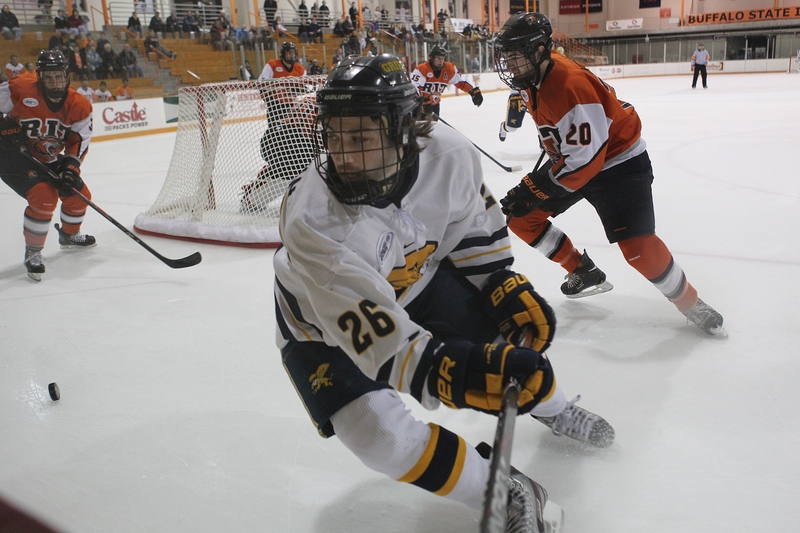 Sullivan developed into the top-line center for the Golden Griffins during last year’s NCAA Tournament run and he is part of a group of seven seniors looking to create a similar late-season run this March. The Griffs host their final regular season Atlantic Hockey game ever at Buffalo State Ice Arena at 7 tonight when they face RIT. It’s the beginning of the closing chapter for the senior class, and Sullivan gets to enjoy the ceremonial send-off in front of his family and friends. Born in Buffalo, he grew up with his family in Derby and played three years for St. Francis, earning team Most Valuable Player honors before making the transition to juniors. Prepared to go away from home for the junior hockey experience, he wasn’t quite ready to head to Alaska. While it wasn’t part of the original plan, the accident was one of the best things that could have happened to Sullivan. After notching 24 points with the Brown Bears in the 2008-09 season, he moved back to the contiguous United States, this time joining a team that actually did play in Michigan – the Motor City Metal Jackets of the NAHL. It was from there Canisius coach Dave Smith recruited Sullivan, who was eager to return to Western New York and join the Ice Griffs family. Sullivan had his breakout season last year, netting 22 points (eight goals, 14 assists) and finding chemistry on the top line along with Kyle Gibbons and Cody Freeman. This season, Sullivan’s individual success is mirrored in team success. The Griffs are 7-1-1 when he scores a goal and just 5-16-2 when he doesn’t. In the team’s 12 wins this season, he has 15 points (eight goals, seven assists) but just three points in the Griffs’ 17 losses. When Sullivan is on, the Griffs are on. “He’s our No. 1 center. He’s a dominant skater and a physical presence and I don’t think it’s a surprise that when he plays well we win or at least have success,” Smith said. “In a positive way, he’s very simple. It’s just, ‘Where’s the puck, where’s the man, just go out and do it.’ He’s a pleasure to coach because of that. He doesn’t overthink, he just does the best that he can and that’s really all we can ask. Sullivan has a physical game and at 6-1, 210 pounds, he’s the kind of player guys want on their side. No one wants to be on the receiving end of a fired-up Sullivan. “He’s a beast. When he gets going, man I don’t want to be in front of him. He’s a truck. A literal truck,” linemate Kyle Gibbons said. “He’s 6-1, over 200 pounds. He’s a big kid. And when he uses his frame, he’s just as good as anybody in the league. The evolution has been simple. It’s about Sullivan understanding his strengths and playing to them and success has followed.